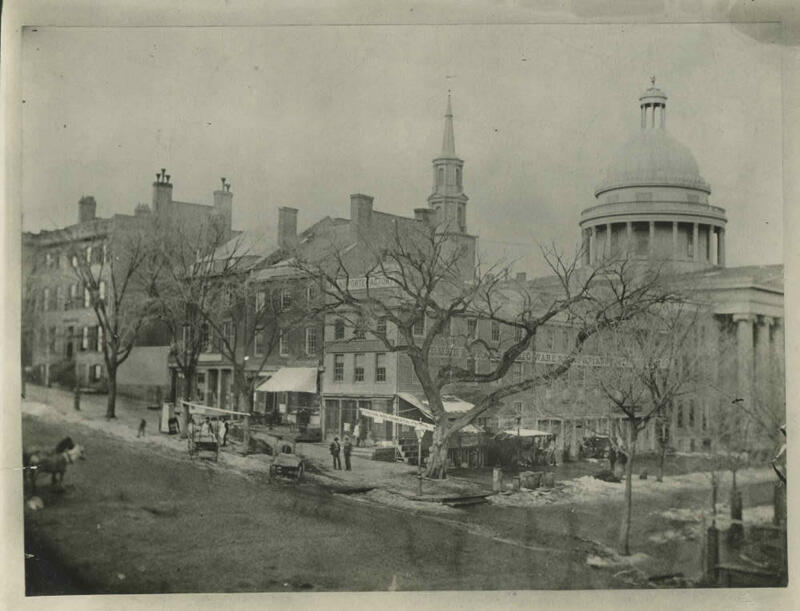 The photo above is of the northwest corner of State and Pearl in downtown Albany, dated 1849. It's from the commercial streets section of the Albany Public Library History Collection. State and Pearl is one of the oldest intersections in the city, and in many ways it's still the heart of downtown. During this period, the building on this specific corner was the Boardman and Gray piano company. But the things that really catches our eye about this photo are the trees -- so tall and stretched out for downtown city trees. That tree on the corner was an elm and not just any elm. It was the elm, said to have been planted by Philip Livingston in 1735. The tree was a city landmark and the corner was known as The Elm Tree Corner. The elm was cut down in 1877 as part of a paving project. Trees do the work of many air conditioners. A smart move for the city or county would be to plant as many trees as possible in our sidewalks. Make the city much more livable...improve neighborhoods....could employ lots of young people. "The elm was cut down in 1877 as part of a paving project." Lmao, the once totally nonchalant attitude toward bulldozing historic resources that would today be considered priceless always gets me. What's worse is that today the name "Elm Tree Corner" is all but forgotten in the local consciousness. Everyone just calls it "State and Pearl", which is a shame. That 'priceless' historic resource would have likely been dead today anyhow. Dutch Elm disease killed over 75% of the elm trees in North America by the mid-1980's beginning in the late 20's. There are hybrid cultivars available today, but they are not the same as the pure North American elm pictured. If those trees were still there today, they would have been mutilated to protect the power lines like all the other trees in the city. It's a shame the elm was cut down for paving, though. Pieces of the Old Elm were saved as souvenirs. I know the Albany Institute of History and Art has at least one piece in its collections. It was displayed alongside a photograph of the tree about a year ago as part of the "Capturing Moments" exhibit. @stan - In some Albany neighborhoods you can request to have trees planted. I know our old neighbor did this. There does have to be enough land between the road and sidewalk. I don't know all the ins and outs of it, and this was about 4 years ago, but it might still be possible! You can buy a tree for the front of your house for about $100. I don't know why this isn't more widely advertised. Please make a post about this.